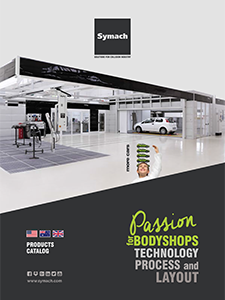 Symach delivered 15th of May this year a new shop for Gemini group in Wacol Brisbane Australia, it is the 5th body shop realized from Symach for Gemini in the last 24 months. This shop is the biggest in Australia, it can repair 190 repairs per week, 38 per day, it is realized using FixLine formula and we have the segmentation of repairs dividing damage into three different processes; • One panel – 2 FixStation with 2 technicians multi skills for a production of 8 repairs per day, • 2-3 panels – 1 FixLine KombiTron for 20 regular repairs per day with 15 technicians. • 1 FixLine SprayTron for 10 repairs per day more than 4 panels including not drivable car with 11 technicians. The new shop is equipped 100% of Symach products and will work using SPAP process, so the key to key time will be 1.5 days average, one of the best qualities and service in Australia.